This is an update to the previous article. A Korean member of SamMobile just revealed an image which shows invitation for the Samsung Mobile Unpacked Event. 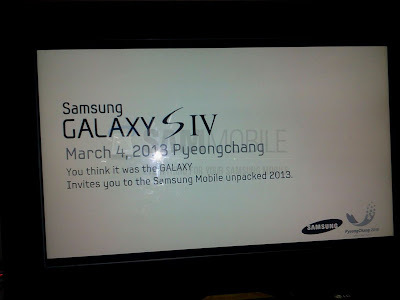 The event will be happening in Pyeongchang, Korea on March 4, 2013 and will be revealing the much awaited Samsung Galaxy S IV. Slogan for event "You think it was the GALAXY" looks really weird.